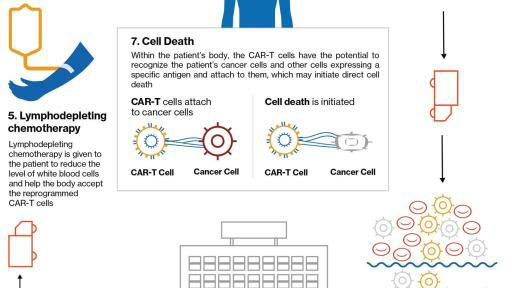 East Hanover, NJ, August 30, 2017 Novartis announced today that the US Food and Drug Administration (FDA) has approved Kymriah™(tisagenlecleucel) suspension for intravenous infusion, formerly CTL019, the first chimeric antigen receptor T cell (CAR-T) therapy, for the treatment of patients up to 25 years of age with B-cell precursor acute lymphoblastic leukemia (ALL) that is refractory or in second or later relapse. 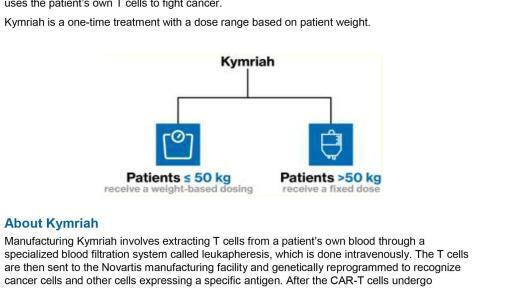 Kymriah is a novel immunocellular therapy and a one-time treatment that uses a patient’s own T cells to fight cancer. Kymriah is the first therapy based on gene transfer approved by the FDA. 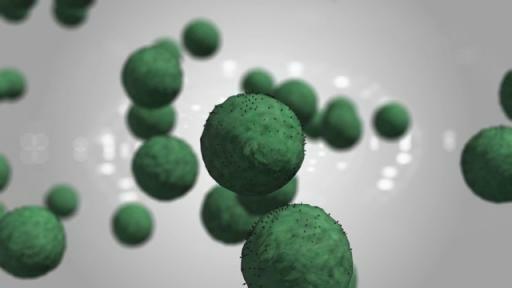 There has been an urgent need for novel treatment options that improve outcomes for patients with relapsed or refractory (r/r) B-cell precursor ALL, whose prognosis is poor. Patients often undergo multiple treatments including chemotherapy, radiation, targeted therapy or stem cell transplant, yet less than 10% of patients survive five years2,3. In close collaboration with Novartis and Penn, Children’s Hospital of Philadelphia (CHOP) was the first institution to investigate Kymriah in the treatment of pediatric patients leading the single site trial. 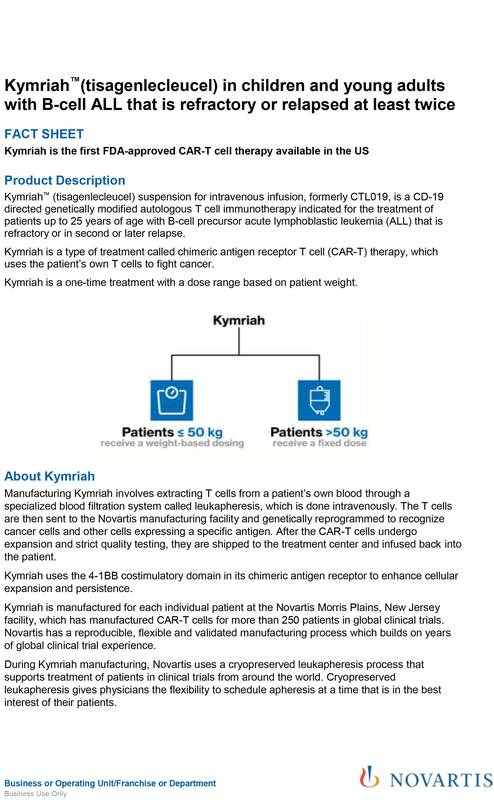 Kymriah will be manufactured for each individual patient using their own cells at the Novartis Morris Plains, New Jersey facility. Novartis has designed a reliable and integrated manufacturing and supply chain platform that allows for an individualized treatment approach on a global scale. This process includes cryopreservation of a patient’s harvested (or leukapheresed) cells, giving treating physicians and centers the flexibility to initiate therapy with Kymriah based on the individual patient’s condition. 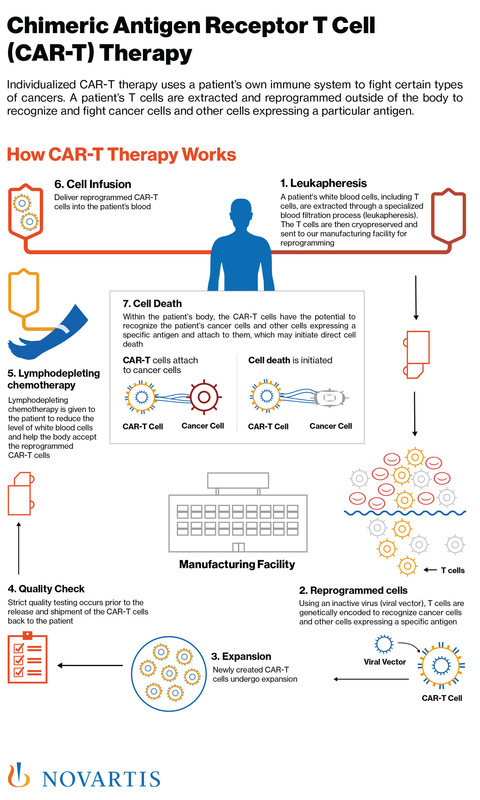 Building on our experience, having manufactured CAR-T cells for over 250 patients from 11 countries across various indications, we have demonstrated a reproducible product. 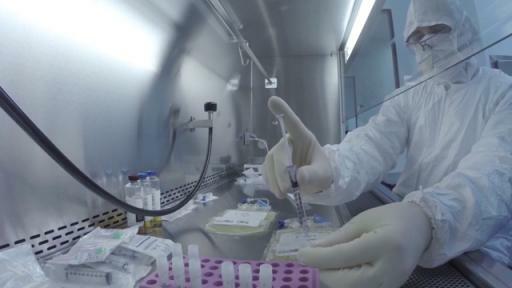 Novartis continues to advance its CAR-T manufacturing expertise in Morris Plains, where we have been supplying CAR-T cells for global clinical trials and where we continue to invest in support of the anticipated demand to meet the needs of patients. 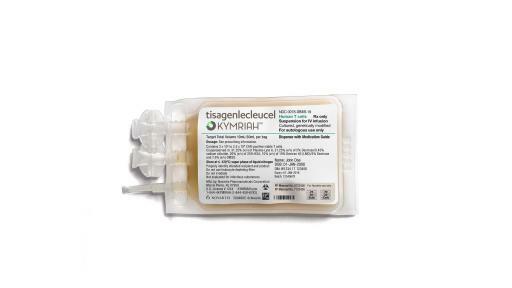 The FDA approval of Kymriah is based on the results of the pivotal open-label, multicenter, single-arm Phase II ELIANA trial, the first pediatric global CAR-T cell therapy registration trial examining patients in 25 centers in the US, EU, Canada, Australia and Japan. In this Novartis-sponsored study, 68 patients were infused and 63 were evaluable for efficacy. 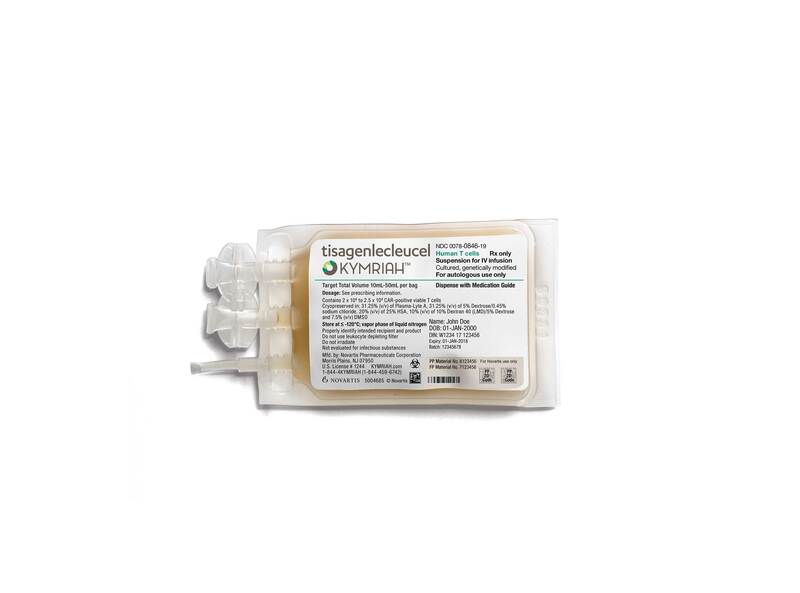 Results show 83% (52 of 63; 95% confidence interval [CI]: 71%-91%) of patients who received treatment with Kymriah achieved complete remission (CR) or CR with incomplete blood count recovery (CRi) within three months of infusion. In addition, no minimal residual disease (MRD) – a blood marker that indicates potential relapse – was detected among responding patients. Median duration of remission was not reached (95% CI: 7.5-NE)1. The most common (>20%) adverse reactions in the ELIANA trial are cytokine release syndrome (CRS), hypogammaglobulinemia, infections-pathogen unspecified, pyrexia, decreased appetite, headache, encephalopathy, hypotension, bleeding episodes, tachycardia, nausea, diarrhea, vomiting, viral infectious disorders, hypoxia, fatigue, acute kidney injury and delirium. In the study, 49% of patients treated with Kymriah experienced grade 3 or 4 CRS, an on-target effect of the treatment that may occur when the engineered cells become activated in the patient’s body. CRS was managed globally using prior site education and implementation of the CRS treatment algorithm. Within eight weeks of treatment, 18% of patients experienced grade 3 or 4 neurologic events. There were no incidents of cerebral edema. The most common neurologic events were encephalopathy (34%), headache (37%), delirium (21%), anxiety (13%) and tremor (9%). ALL is a cancer of the lymphocytes, a type of white blood cell involved in the body’s immune system. In people with ALL, the abnormal cells crowd other types of cells in the bone marrow, preventing the production of red blood cells (which carry oxygen), other types of white blood cells and platelets (parts of the blood needed for clotting). As a result, those with ALL may be anemic, more likely to get infections and bruise or bleed easily4. 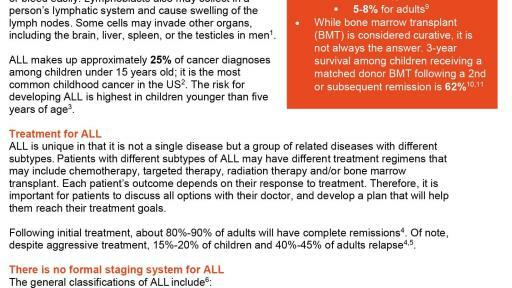 ALL comprises approximately 25% of cancer diagnoses among children under 15 years old and is the most common childhood cancer in the US5. Despite overall improvements in outcomes of pediatric/young adult B-cell ALL, effective treatment options for patients that have relapsed or are refractory to treatment are limited6,7,8. This press release contains forward-looking statements within the meaning of the United States Private Securities Litigation Reform Act of 1995. Forward-looking statements can generally be identified by words such as “pioneering,” “commitment,” “breakthrough,” “mission,” “is establishing,” “will,” “investigational,” “step forward,” “may,” “are creating,” “next wave,” “eager to progress,” “committed,” “is working to,” “plans,” “later this year,” “anticipated,” “would,” “under discussion,” “potential,” “look forward to,” “potentially,” “strategy,” “underway,” “efforts,” “focused on,” “next generation,” “continues to advance,” “continue to invest,” “Breakthrough Therapy designation,” or similar terms, or by express or implied discussions regarding potential marketing approvals, new indications or labeling for Kymriah and the other investigational products described in this press release, regarding our ability to implement, scale and sustain commercial manufacturing for Kymriah or the other investigational products described in this press release, regarding our ability to build a network of treatment centers to offer Kymriah or the other investigational products described in this press release, regarding the potential future success of patient support programs or patient access solutions for Kymriah or of the collaboration with CMS to establish indication-based pricing and outcomes-based payments for CAR-T cell therapies, or regarding potential future revenues from such products. You should not place undue reliance on these statements. Such forward-looking statements are based on our current beliefs and expectations regarding future events, and are subject to significant known and unknown risks and uncertainties. Should one or more of these risks or uncertainties materialize, or should underlying assumptions prove incorrect, actual results may vary materially from those set forth in the forward-looking statements. There can be no guarantee that Kymriah or the other investigational products described in this press release will be submitted or approved for sale or for any additional indications or labeling in any market, or at any particular time. Neither can there be any guarantee that Novartis will secure continued approval for Kymriah or the other investigational products described in this press release following accelerated approval. Nor can there be any guarantee that Novartis will successfully implement, scale and sustain commercial manufacturing for Kymriah or the other investigational products described in this press release, or successfully build a network of treatment centers to offer Kymriah or the other investigational products described in this press release. 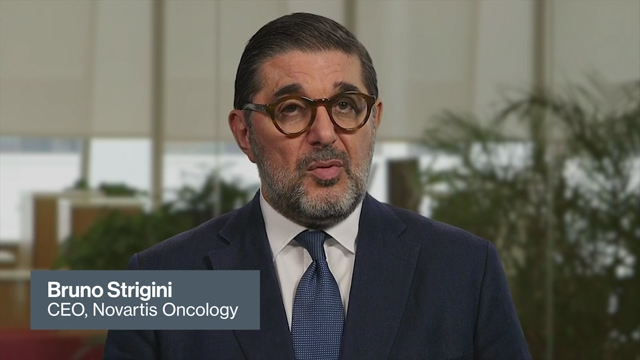 Neither can there be any guarantee that Novartis will successfully implement patient support programs or patient access solutions for Kymriah or the other investigational products described in this press release, or that the collaboration with CMS to establish indication-based pricing and outcomes-based payments for CAR-T cell therapies will be successful or achieve its intended goals. Nor can there be any guarantee that Kymriah or the other investigational products described in this press release will be commercially successful in the future. In particular, our expectations regarding Kymriah and such other investigational products could be affected by, among other things, our ability to successfully implement, scale and sustain commercial manufacturing and build a network of treatment centers; our ability to successfully implement patient support programs and patient access solutions; our ability to secure continued approval following accelerated approval; our ability to successfully establish indication-based pricing and outcomes-based payments for CAR-T cell therapies in collaboration with CMS; the uncertainties inherent in research and development, including clinical trial results and additional analysis of existing clinical data; regulatory actions or delays or government regulation generally; our ability to obtain or maintain proprietary intellectual property protection; the particular prescribing preferences of physicians and patients; global trends toward health care cost containment, including government, payor and general public pricing and reimbursement pressures; general economic and industry conditions, including the effects of the persistently weak economic and financial environment in many countries; safety, quality or manufacturing issues, and other risks and factors referred to in Novartis AG’s current Form 20-F on file with the US Securities and Exchange Commission. Novartis is providing the information in this press release as of this date and does not undertake any obligation to update any forward-looking statements contained in this press release as a result of new information, future events or otherwise. Ronson, A., Tvito, A., Rowe, JM., “Treatment of Relapsed/Refractory Acute Lymphoblastic Leukemia in Adults.” Current Oncology Reports, 2016 Jun;18(6):39. https://www.ncbi.nlm.nih.gov/pubmed/27207612. Accessed August 4, 2017. 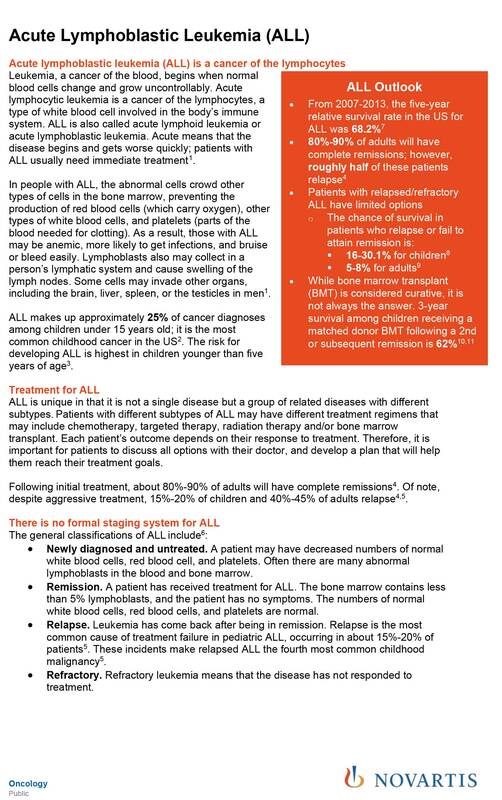 Leukemia & Lymphoma Society, “Acute Lymphoblastic Leukemia.” https://www.lls.org/leukemia/acute-lymphoblastic-leukemia/treatment/relapsed-and-refractory. Accessed August 4, 2017. National Cancer Institute, “Childhood Acute Lymphoblastic Leukemia Treatment (PDQ®) – Patient Version.” https://www.cancer.gov/types/leukemia/patient/child-all-treatment-pdq#link/_1. Accessed August 4, 2017. Howlader, N., Noone, A.. M, Krapcho, M., et al. SEER Cancer Statistics Review, 1975–2010. National Cancer Institute, April 2013; Section 28.9 (12).